Pan America Mission and its sister organization in Colombia, Mision Panamericana de Colombia, are dedicated to the preaching and teaching of the Word God for the salvation of the Spanish-speaking peoples and various indigenous Indian tribes, and to the task of establishing local churches pastored by Nationals. 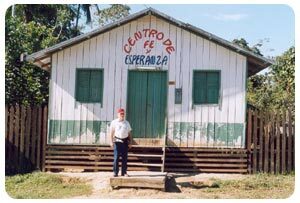 Founded in 1958 by Missionaries Ignatio Guevara and Ira Washburn to help the needs of missionaries whom God had called and sent to Colombia, South America. Over 460 Churches established with National Pastors in Colombia, Peru, Brazil, Argentina, and Honduras. Reaching Indian Tribes in Colombia and along the Amazon River. 3 Bible Training Institutes founded for training national pastors.